Tradition! 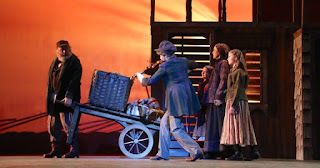 The opening song of Fiddler on the Roof speaks of the traditions in the little Russian town of Anatevka in the early 20th Century, setting the stage for a story steeped in tradition, when to hold on to it and when to let go and embrace a new way of doing things. The new production at Artistry (formerly known as Bloomington Civic Theatre) is also steeped in tradition. There's nothing really new or innovative about this production; it's a faithful interpretation of this classic musical that, though a bit too long, is full of beautiful and familiar music and much heart in this universal story of a specific family. Artistry has assembled a huge and talented cast, and as always the score sounds gorgeous coming from the nearly 20-piece pit orchestra. If well done traditional classic musical theater is your thing, you might want to check this one out before it closes on May 8. 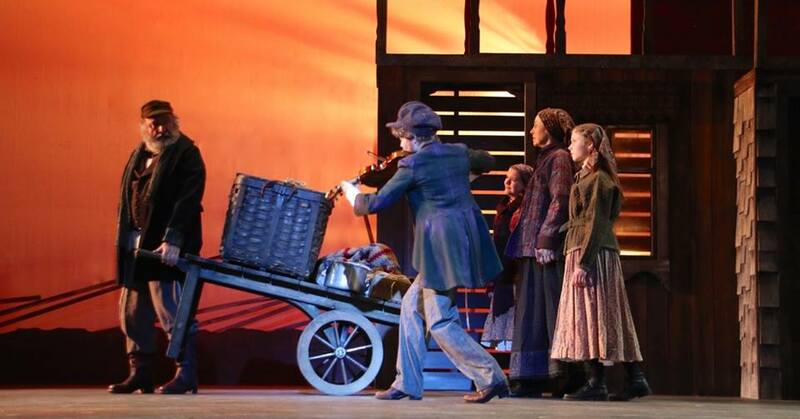 Making his debut at Artistry, John Paul Gamoke is just wonderful as Tevye, who is not only the main character but also the heart and soul of the show. He perfectly embodies the gruff but lovable Tevya. He's well-partnered with Wendy Short-Hays' Golde. The daughters (Kelly Matthews, Anne Brown, and Maddy La Roche) and their beaux (Riley McNutt, Ryan London Levin, and the sweet-voiced Eric Sargent) are also well-cast, I only wish we had more time to spend with each one. The rest of this 30-person cast (this is not a small show!) fill out all the roles and make Anatevka seem a busy and welcoming place to live. One of the best things about Artistry is their full and traditional pit orchestra, which you don't see a lot anymore. As much as I love a sparse musical, there's nothing quite like the thrill of a pit orchestra, especially when conducted by Artistry's resident Music Director Anita Ruth. From the first simple line of the fiddle, through the big rousing dance numbers and tender ballads, and back again to the simple lovely fiddle, this familiar and beloved score rings out pure and beautiful. Director/choreographer Michael Gruber has put together some fantastic dances, especially the always thrilling bottle dance. Although I'm not sure why several of the bottle dancers are women in beards, and why can't the fiddler just be a woman? Even Tevye might be OK with that in 2016. 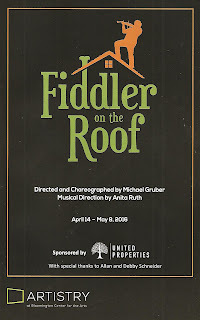 Fiddler on the Roof is the final musical in Artistry's first season under this name, a season that also included an energetic Hairspray, a beautiful and epic Phantom (no, not that Phantom), and a super fun Best Little Whorehouse in Texas. Next season includes some exciting choices that are less, well, traditional: The Drowsy Chaperone, The Baker's Wife, Little Shop of Horrors, and The Secret Garden. I might also need to make the long drive down to Bloomington for some of their plays, which include Talley's Folly, Bad Dates featuring Christina Baldwin, and Wit starring Sally Wingert. 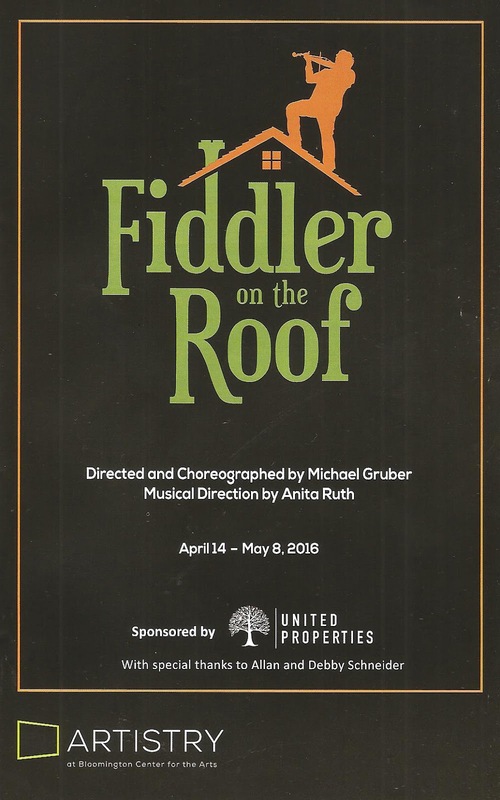 The 2016-2017 season looks like a great one, but in the meantime you can enjoy the lovely traditions of Fiddler through May 8 (and Blithe Spirit opening in May in the black box theater). *Plot summary borrowed from what I wrote about the 2013 production at Chanhassen Dinner Theatres.